If you've never built one of these before, you owe to yourself to do some research before you get underway. There are a few things you need to know before you put glue to plastic. Magnetizing is an added benefit, not necessary, but definitely nice to do. 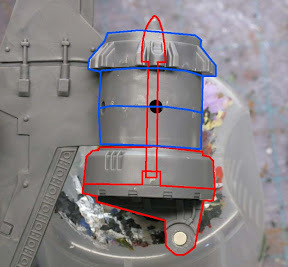 This tutorial covers the basic construction and magnetizing of the doors and both weapons for the drop pod. 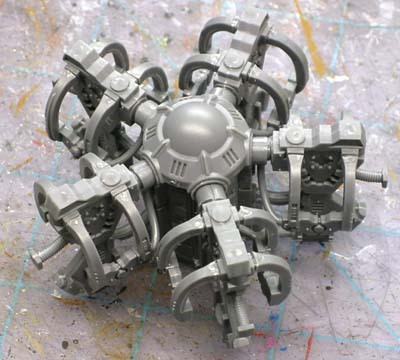 You can skip the magnetizing parts and still use all the info here to build your pod. Believe me, reading this before you attempt to build your own will help you out tremendously. I wish I had it before I started mine. Make sure to read through the whole thing before attempting it though. While it's presented in the order you should do things, there is some room to move things around and depending on what tools you have available, you may need to do just that. The follow up to this post will be the painting of the same pod. The construction of this is designed to allow easy painting of the final three sub-assemblies so that you can get into all the tight spaces fairly quickly and easily with the last step being to glue the three components together. Start out by making sure you have all your pieces and your tools. 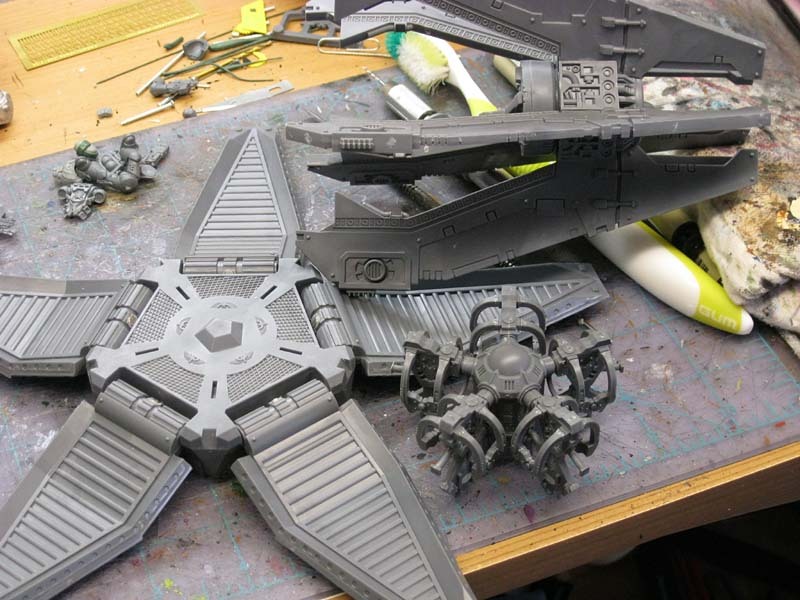 If you're magnetizing this, you'll need a few more things in addition to your clippers, files and glue. I use 1/8 inch rare earth magnets for my work. I've got a 1/8 drill bit that I use to create the perfect size hole for the magnets to rest comfortably in. This project requires 13 magnets when all said and done. 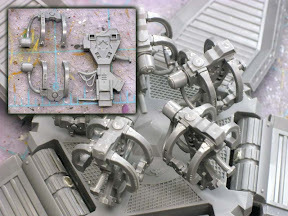 I've found it easiest to clip everything from the sprue and take care of all my mold lines. Once I have everything ready, then I start building. We're going to build three sub-assemblies. The inner harness assembly, the floor and doors and the engine/fin assembly. This is perhaps the most important thing of the whole project. Understanding this little tidbit matters. Unfortunately, GW is not that clear in their directions and most of us have figured this out by trial and error. The center console itself can sit on the floor base facing any direction. The key is getting the components of the Sergent's individual harness correct. To do that, we need to know what components make up the Sergeant harness. On the center console itself, it will be the one panel that has the keypad and readout screen and not just two blank spots. 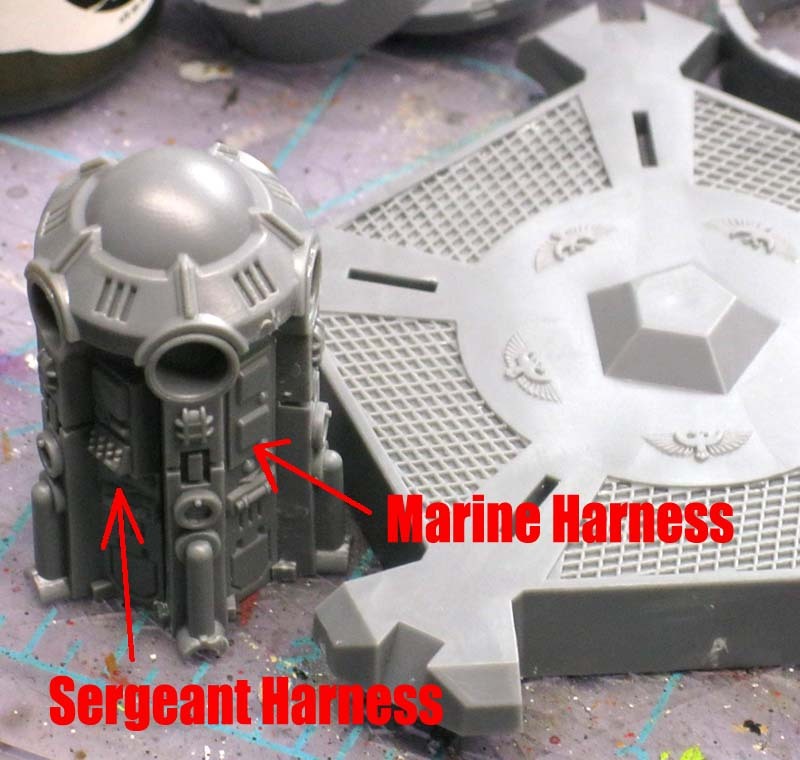 The blanks spots are all the Marine harness points. GW provides this tiny picture in the instructions but no real explanantion as to why it's there. There are three things you need to note about the drawing. 1. 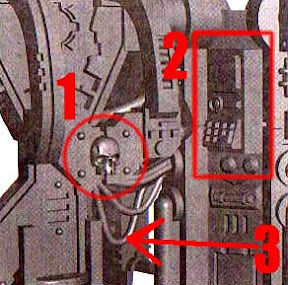 The Sergeant shoulder harness is the one with the skull. The rest have round blanks in the same position. 2. That particular harness/upright assembly needs to plug into that particular panel on the center console. 3. The Sergeant also has a specific upright piece as well and it can be determined by the low hanging cable that none of the other uprights have. If you try and fit any other harness into the Sergeant upright, you'll notice that you'll have considerable trouble. This is because the pegs for his particular shoulder harness are made to fit into his particular upright piece. Get this correct and the rest is a piece of cake. You can see each "harness" is actually two (one on each side) and an upright in the middle. I built all of my harnesses and then attached them to the console making sure to put the Sergeant harness next to the correct panel on the console. In the picture there, I have them resting on the floor piece, but they are NOT glued in place yet to the floor. And the completed inner harness assembly. Each harness has been glued into the console. This part is done now. We can set it aside for later on. The majority of the work here is due to the fact that I magnetized the doors. Drop that option and you should be able to cruise through this portion with ease. The first thing is to build each door by gluing the halves together. I elected to magnetize the doors in such a way that the magnet is not obvious and positioned at the tip of the door when opened. I wanted to keep the doors upright, but did not want them to close so tightly that it would be difficult to get the open either. The drawback to this method is that the magnets are positioned in such a way that if they do break, it will be almost impossible to repair. They should not need to be repaired I believe with normal use, but it's worth noting and being aware of it if that is a big concern when building your own pod. We start by gluing a small piece of sprue (narrow end upright) just a millimeter or two from the edge of each door opening. Mark the middle of it along with the middle of your door. It's best to place the door in the frame to see how it all lines up. The magnet will go in the door itself just above the seam between the two halves as seen in the picture. The line up between both magnets does not need to be perfect, but you want to get it as close as possible. Also make sure that your magnets are flush with the surface they are embedded in. There is not a lot of wiggle room here and it pays to get as close as possible. Drill your hole in each piece and secure your magnet to each half. I don't think I need to remind everyone about magnet polarity. If you get it wrong, you'll need some creative cutting to extract the snugly glued in place magnet. Once you have all the doors done this way, you can test them out to see how they work. There should be just enough draw between the magnets that the door will "pop" into the upright position when it gets close, but not so much that it can't easily be pulled away. Here you can see how the finished door will look. The magnet is barely visible in the open position. When closed, you can see how the two magnets line up (this is prior to the floor being glued in place). You'll want to make sure all of your doors are functioning correctly prior to gluing the floor decking in place. Once it's down, you can't make any more adjustments. Inevitably, one door will not operate as smooth as the other four. You'll need to do some cleaning up of the joints in order to make sure everything works as it should. Using this picture as a guide, we're going to clean up a few connections to make sure everything operates without trouble. All we're trying to do here is take the tip of our X-Acto blade or file and clean away a bit of the surface area to increase the tolerances. If you're using a file, you may need to back up and do this before gluing everything in place as you won't be able to get in there once it is glued. 1. 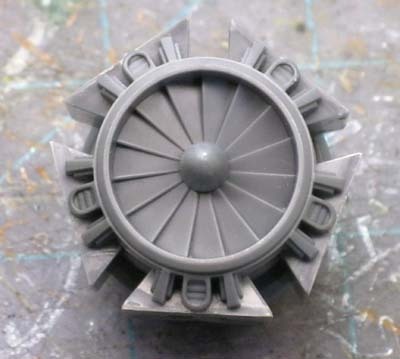 This is actually for the fins to connect to in the next part. We just want to make sure they can be slotted in here without having to squeeze them in place. 2. The bottom of the door and the top of the floor deck. If this area is snug, you won't be able to get your door closed all the way without having to force it into position and we don't want to have to do that. 3. Make sure the sides of your doors are kept clean and free of glue and debris. Any junk in here will also make moving the door troublesome. In the end, we want our doors to all close up to this position. There shouldn't be much of a gap between them when closed. Not much more than the thickness of the stabilizing fin that goes between them. Will you get them 100 percent perfect? No. You shouldn't kill yourself trying to do it either. With a little work, you should be able to get real close. You just have to keep in mind that this is plastic we're working with and these things are not as perfect as we'd like them to be sometimes. Just look at the old Land Speeders. Once you are comfortable with how all your doors are operating, glue the top portion of the floor deck to the base. This part is done. 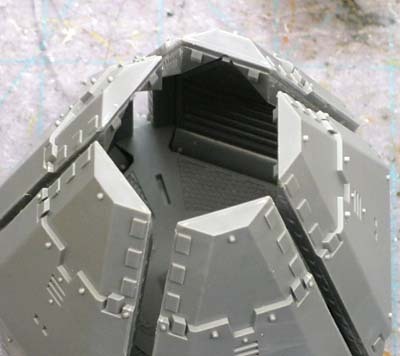 You can also glue the engine vents to the underside at this time. We start with building the upper engine assembly. The stabilizing fin you see in the picture is for reference only. It is not glued in place at this point. The red pieces are glued together and the blue pieces are glued together. 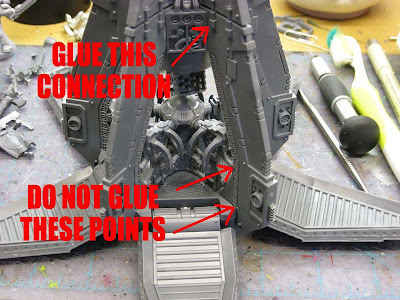 This will allow you to actually rotate the weapon mount when done if you are careful in how much glue you use later on. You can see the magnet in the middle of the weapon mount. I cut away the stud, drilled out the hole and inserted a magnet into the opening. Whatever magnet you use, make sure it is not any thicker than the width of the plastic for the mount. If you look closely, you can see that each weapon has a magnet inside it too. Where it would connect to the mount by way of the pin, I have glued a magnet in place there. Again, make sure you check your polarity. Once you glue the weapon halves together, it may real tough to get them apart to fix it. Doing it like this will allow you to use the parts that come with the pod and still make the weapons interchangeable. It's just a matter of sliding one off and sliding the new one in place. Next we glue on the five engine housing pieces to the upper engine. This will allow us to position our fins on the engine correctly in the following step. This last part can be a bit tricky, but once you get two fins in place, the rest will be easy. The first thing you do is set you inner harness assembly down on the floor deck. It should sit in place without any trouble. DO NOT glue it in place yet. 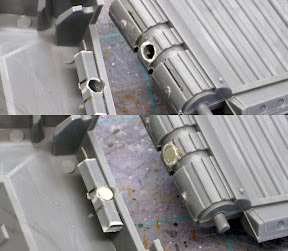 With the harness in place, take your upper engine assembly and add a drop or two of glue in the slot created by two of the engine blocks you just added to it. With your upper engine assembly in one hand and a fin in the other, you want to position the fin correctly on the floor deck (make sure it's connected to the harness correctly too) and then glue it to the upper engine housing. Things should fit together snug enough that they will hold while the glue dries. What we are trying to do is simply glue the fins to the upper engine housing without gluing it to anything else just yet. This allows us to lift the engine/fin assembly straight up when dry and remove the harnesses as well. 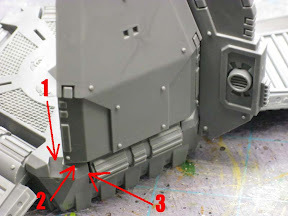 Before you take all the assemblies apart, make sure to place a dot on the underside of each one so that you can line everything back up together once you have it painted. In a perfect world, all of them would be the same and you wouldn't have to worry, but we don't have that luxury here. 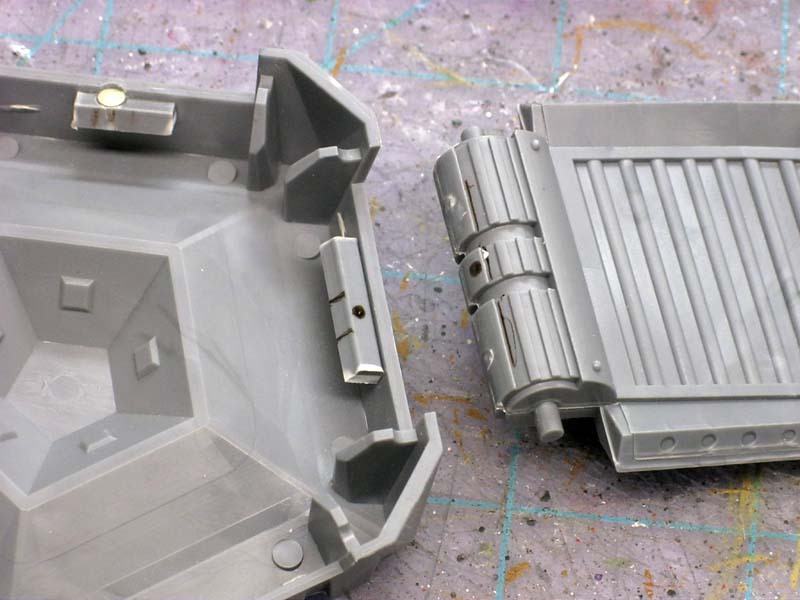 We should have three distinct sub assemblies now that we can paint and then reassemble afterwards. If this seems like a lot of work, it is. But... 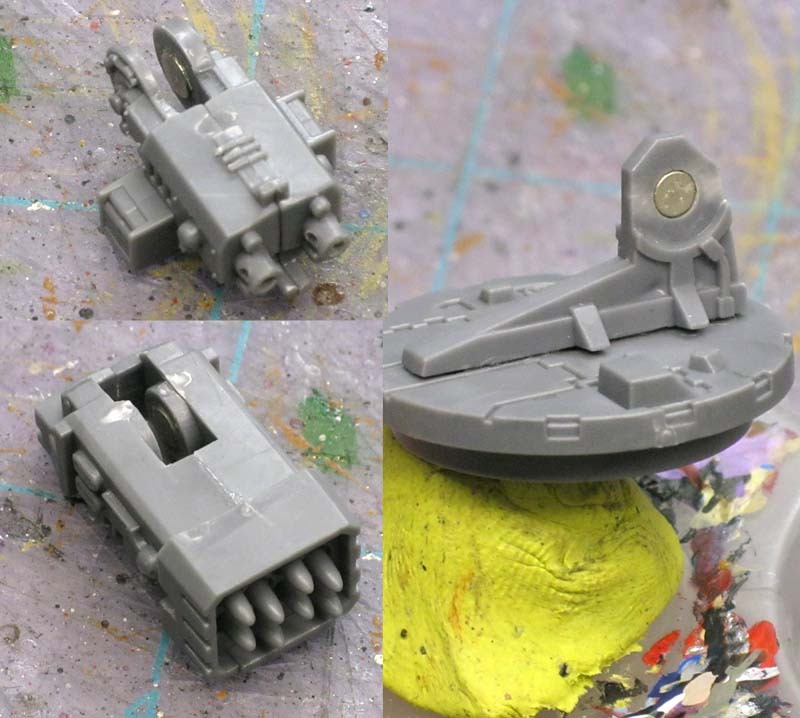 I have three pieces now that I can paint up fairly quickly and reassemble without any trouble creating a complete drop pod. The next post will show you how to paint it and assemble the pieces. Nice, I built two of those and never thougth of using magnet on the door. Thanks Ron, I already knew that it is a trick model to build, about the magnets I was thinking of using them in the upper part not there a must to try. I have tried magnets on the upper part of the door and I found that it still doesn't quite work. Really wish this post had been around when I put my 5 drop pods together. Great post. Cheers. Excellent post Ron! One tip on magnets: after having several break loose from super-glue, I've taken to embedding them in a bit of green stuff. Very good tutorial. I will certainly be referencing it when I get around to finishing the drop pods I have. Big fan of magnets I found this post very useful. I really like the approach. Thanks for the feedback guys. I'm glad it helps. Reading this makes me want to get some to try using. I love how the model looks. @Hudson - I've recently had the same experience with magnets and came up with the same solution. Not all of them break loose but cementing them down with a bit of greenstuff gives a little piece of mind. 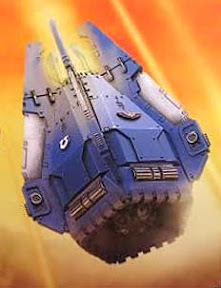 @Ron - I have been planning to get some Drop Pods for my Dark Angels for a while now. I'm glad you wrote this up before I get them. Very cool stuff. Yet another great tutorial, and I'd like to add a little something to it from too much experience helping others with drop-pods, if I may. 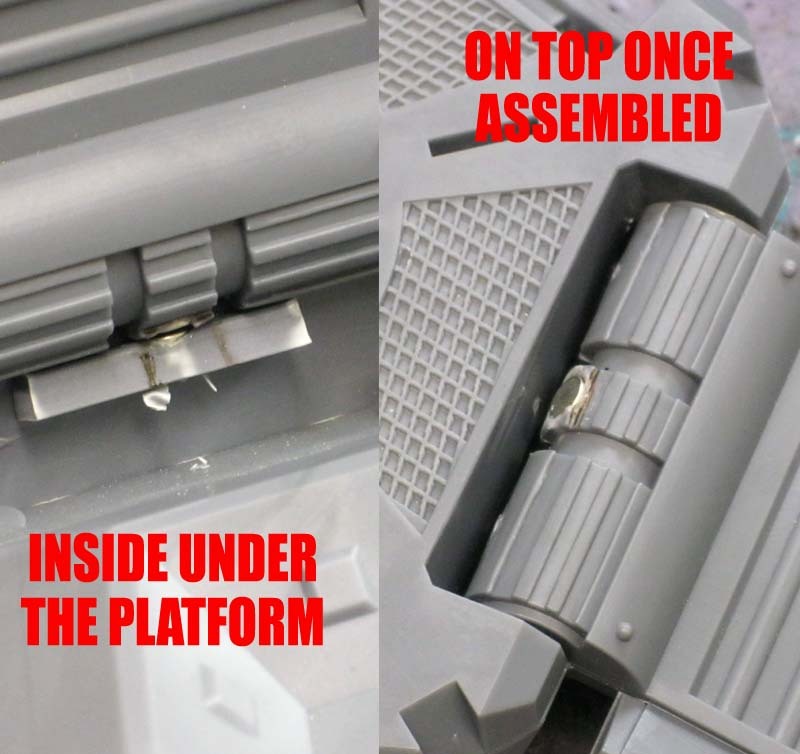 The most important part of getting the doors to close properly, is trimming off a little tab of plastic. 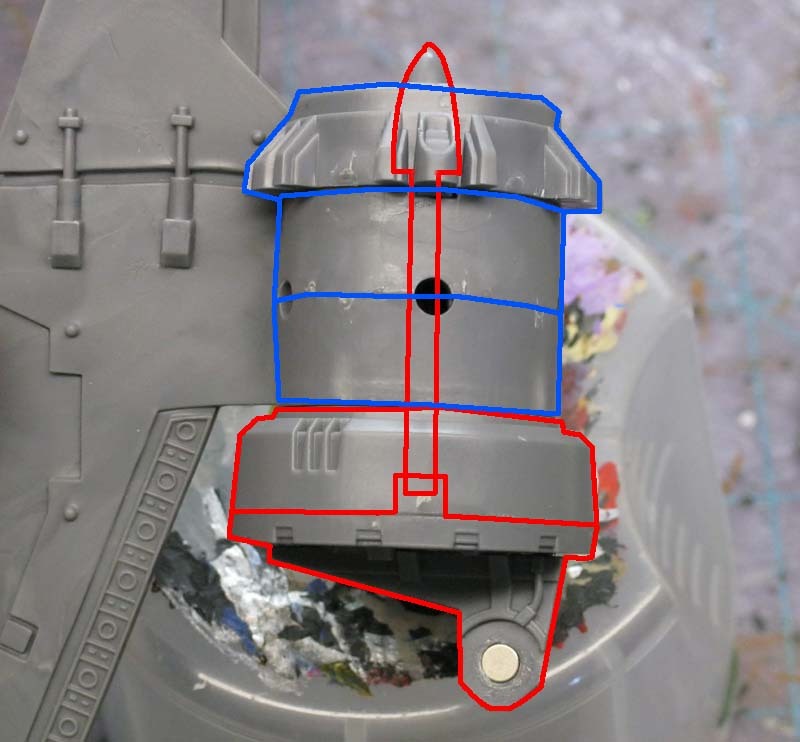 In the area marked "2" in your arrowed image, but better seen in the bottom half of the picture 2 above that one (the one with the holes for and magnets in place) is a small seam of plastic that is parallel to the peg the door rotates on. This sticks out just a little too far and presses against the base of the drop-pod when you try to close the doors. If you trim this flat, the doors will close absolutely fine and stay shut even without the need for magnets. I could send an image if it makes it clearer. However, every time I've helped someone in the FLGS, removing that one seam allows the doors to close nicely. Thanks for everything you do for our community, and great to have you back. ahh, now I know why my drop pod wasn't coming together! Thanks Ron! Andy - bG: Good point. I tried to make note of every little thing I did as built it since not much comes with the model in terms of "directions." I can't tell you how much this tutorial has helped me. I just assembled 5 drop pods at once, after having never done a single one before. All magnetized doors. I couldn't have done it so quickly or easily without this tutorial. Thank you. This site is amazing. Keep up the good work! Tim: Excellent, I'm happy to hear it helped. After going through one myself, I figured I would try and help others avoid some of the common pitfalls with this model. Anon: There's a good bit to this model that escapes a first look. That was the reason for going over this as in-depth as I did. So you all didn't have the same troubles I did.